In The Works is be presented monthly and feature three composers or composer teams, each presenting about 20 minutes of new material. 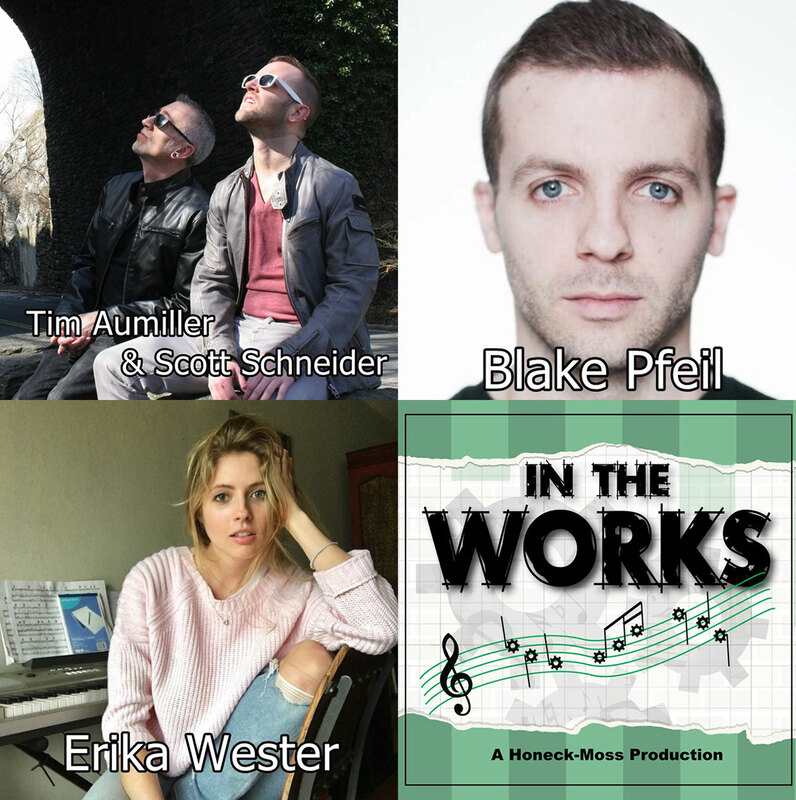 This month features the works of composers: Tim Aumiller & Scott Schneider, Blake Pfeil, and Erika Wester. Hosted by: Thomas Honeck. His songwriting work has heard life in venues across NY, including headliner appearances at Joe’s Pub, 54 Below, Rockwood Music Hall, the Highline Ballroom, among others. Blake’s debut album WALLPAPER is available anywhere you can stream/buy music online. His Joni Mitchell-inspired theatrical creation THE BBC 1970 has seen three workshops at Rockwood Music Hall, Feinstein’s/54 Below, and Icaro Teatro in Queretaro, Mexico. Blake is also one of the cofounders of Macabre Americana (currently in-residence at Rockwood Music Hall) and worked as the resident composer for the government-operated Gyeonggi English Village in South Korea from 2010-2011. Blake has served as a guest artist for Concordia College, Icaro Teatro in Mexico, and most recently with the National YoungArts Foundation as the composer for Jay Jackson’s (aka Laganja Estranja from RuPaul’s Drag Race Season 6) new immersive dance piece [IN]visibility. As a proud member of Actor’s Equity, Blake’s credits include the Shakespeare Theatre of NJ, Huntington Theatre Co., New Repertory Theatre, among others. Blake’s currently runs operations for the true storytelling organization TMI Project and has contributed writing to an array of publications and blogs including CronArtUSA, 21CM, Picsart, and Groove Magazine in South Korea. Blake recently received his MA in Arts Entrepreneurship from SUNY Purchase, received his BFA from Emerson College, and is an alumni of the National YoungArts Foundation. Blake resides in the Hudson Valley, NY with his husband Bryan and is currently working on his first musical, JANE & HANK & the GREAT/BIG/VERY UNFORTUNATE WORLD. ERIKA WESTER is a singer songwriter and composer originating from New Jersey. She has performed in Los Angeles and New York and can be heard singing with the band Yellowbird Mantra on all streaming platforms. She is releasing her first EP this year.